Mercury Analyses, Radioisotope Measurement and Selenium Analysis at Flett Research Ltd.
Flett Research Ltd. is an environmental laboratory and consulting firm in Winnipeg, Manitoba, Canada. Founded in 1978 by Dr. Robert Flett (PhD), the company specializes in the analysis of mercury and environmental radioisotopes. We have supplied services to clients from North and South America, Europe and Asia. Our specialized clean lab and highly sensitive equipment allow us to analyze ultratrace levels of mercury (Hg), including both total and methyl mercury, in a wide array of environmental samples (water, sediments, plant/animal tissues, hair, ambient air etc.). 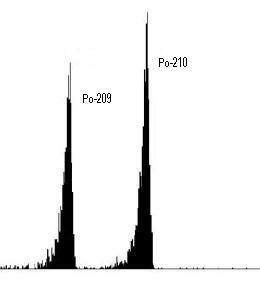 Typical method detection limits in 100 mL of water are ~0.04 ng/L for total mercury and ~0.02 ng/L for methyl mercury. Lead-210 ( Pb-210 ), Cesium-137 ( Cs-137 ) and Radium-226 ( Ra-226 ) are the environmental radioisotopes that we analyze most frequently, primarily for the purpose of dating sediment cores. The dating of sediment cores by the Pb-210 method can be used to determine the sediment accumulation rate for a body of water and the age of the sediments at a particular depth can be inferred. The age of sediments at different depths can be used to document historical contamination. Beryllium-7 ( Be-7 ) is also measured for clients wishing to know if a sediment is recent i.e. deposited less than 1 year before sampling. Flett Research can analyze sediment and soil for Cs-137, Ra-226 and Pb-210 for environmental health and safety purposes. Flett Research is accredited by the Canadian Association for Laboratory Accreditation (CALA). Accreditation recognizes technical competence for a defined scope, operation of a laboratory quality management system and compliance with International Standard ISO 17025. To see our scope of accredited tests follow this link to the CALA website.